Cool and pour over vegetables. Refrigerate. Will keep for weeks. Adapted from Simple Vegetarian Pleasures by Jeanne Lemlin. New York, NY: HarperCollins Publishers, 1998. This is delicious and easy. And everyone in my house will eat it. Always a plus. Mix the peanut butter and soy sauce in a small saucepan until smooth. Stir in remaining ingredients, reserve some scallions for garnish. Warm over low heat. Cook the spaghetti, drain and mix with sauce and garnish with remaining scallions. Beat butter and cream cheese until smooth. Add flour, mix until soft dough forms. Cover and refrigerate at least 1 hour. Melt butter, stir in remaining filling ingredients. Shape tart dough into 1-inch balls. Place balls into ungreased cups of a mini muffin pan and press into cups to form shells. Fill each shell, level, with a scoop of filling. Bake 20-25 minutes, until light golden brown. Cool in pan 3 minutes. Remove to rack and cool completely. Sprinkle with powdered sugar. Yield 24 tarts. Straight from Mario’s mother. To me there is something sacred about recipes with their idiosyncrasies, so the not quite English phrasing is left on purpose. For the uninitiated, “o” (oh) in Spanish is “or”. Not being Mexican, I like this on tortilla chips. Thoroughly mix together all ingredients. Refrigerate for 1 hour, Serve with crackers. Kelsey wanted to try fish tacos. If I wasn’t feeling so lazy I might have turned on the computer to look for a recipe. But we thought experimenting would be easier. So here we are, fish tacos meets English fish ‘n chips. Rub the fish with some packaged taco mix and let stand in fridge for about 30 minutes. We had a little under a pound of Alaskan Cod. Dip the fish in the batter and fry in at least 2 inches of oil. I thought it would be a great idea to fry up some taco shells since I had corn tortillas. It wasn’t. 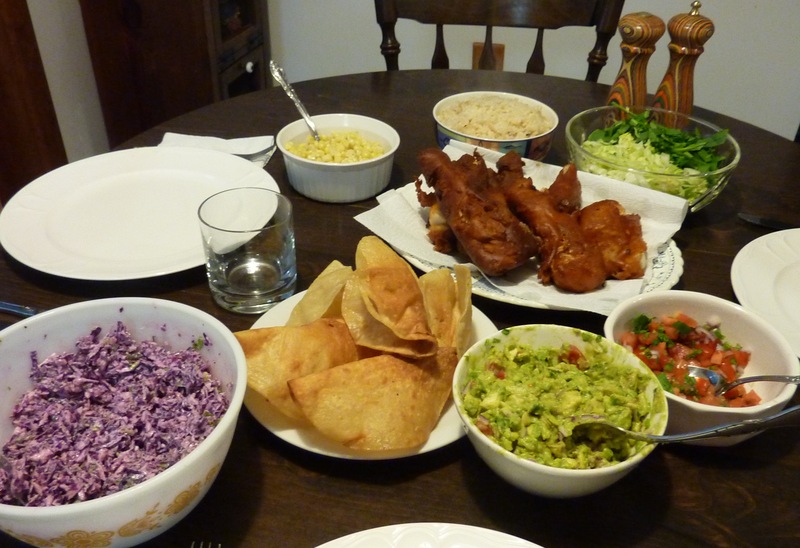 We also had guacamole, rice, red cabbage slaw, corn, some shredded lettuce and pico de gallo. 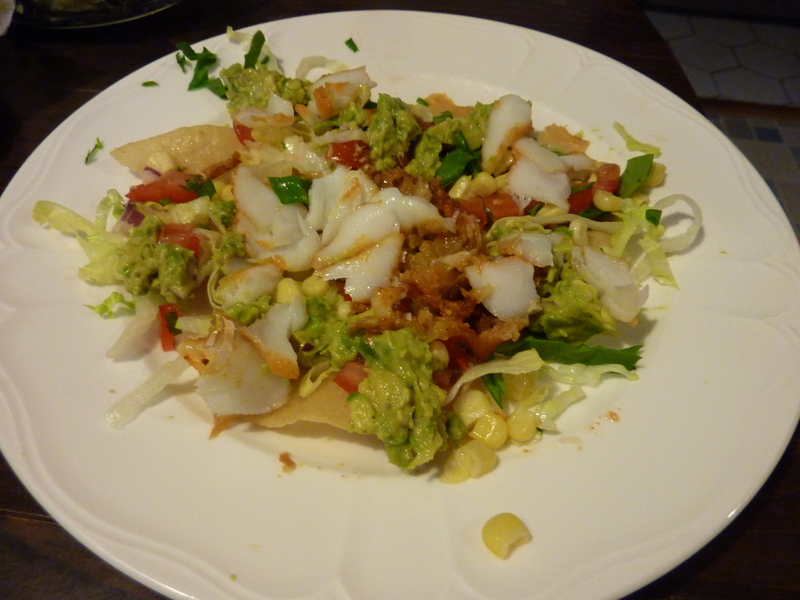 This is adapted from Eating Well magazine, served with their fish tacos, which are much healthier than my version. Mix all the ingredients, except the cabbage, until smooth. Stir in the cabbage. We love avocados. The ingredients usually depend on what is on hand and who is eating it. This is a common “recipe”, again more of just a list of ingredients.